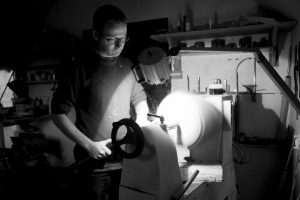 This week a major international player in the craft world has awarded a woodturner from Riverstown the Best Maker in Ireland Award. Matt Jones who works from his studio in Riverstown village, won a prestigious Etsy Regional Award as a direct result of his product designs and handcrafted gifts that he sells via his on-line Etsy Shop. The Etsy Awards are a series of design awards created by Etsy to spread the word about the amazing talent their community of sellers have to offer. Matt was one of thousands who entered the competition and sixty finalists were shortlisted. An expert panel of judges, formed from creative organisations in the UK and Ireland, then selected Matt as the Irish winner. Matt has been selling his products direct to customers through his Etsy Shop since 2011. Visitors can access his shop through www.etsy.com/ie/shop/mattjonesturning. Matt has won the opportunity to exhibit his work at TENT London during London Design Week. “TENT London at The London Design Festival is a brilliant show to to be part of”, said Imelda, Matt’s wife who manages his business development, “so it is great that Matt will be representing Ireland there.